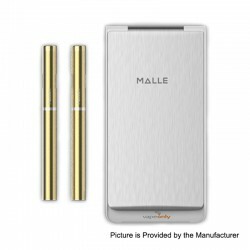 The original VapeOnly New Malle PCC Kit consists of a 2250mAh PCC and 180mAh battery with each set to provide you with all the vaping you need all day long. It is also automatic so you do not need to press any button when vaping. Together with the convenient charging box and easy bottom refilling atomizer. This item also has other colors to choose.